The academy, which was funded largely through a grant and sponsors, was hosted through a collaborative effort between the Monroe County Community School Corp. and Richland-Bean Blossom Community School Corp.
For three days, staff, mostly made up of MCCSC and R-BB teachers, received technology professional development, hearing from guest speaker Alan November and participating in a number of workshops that focused on topics ranging from Introduction to Moodle; iPad basics; ePublishing; Apple iPad iWorks; and Social Networking using Moodle. 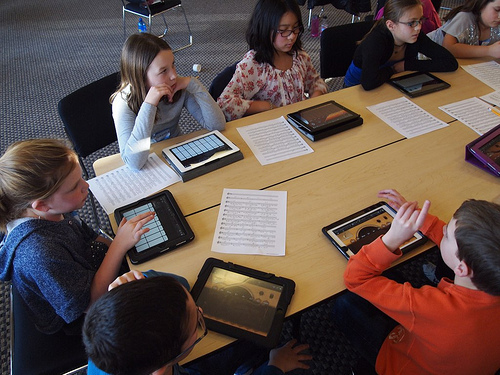 The academy, according to Beverly Smith, director of school and community services at MCCSC, wasn’t simply about teaching educators how to use an iPad, but how to further integrate technology into education. “One of the things I have gleaned, as an administrator and participant, is that we’re going beyond just how to use a piece of technology and it’s integrated into a whole concept of digital learning and to really know how pieces integrate, fit together, and to develop a sense of Web literacy,” Smith said. What is iTeach? If you look at the documents on the event site it seems to be all Apple content. How is it we don’t see this as another very simple intrusion by corporations into our community learning environments? When teachers and admins worry about whether the community “has their back” in support against state intrusion we will simply say “who are you”? You are an iPad, you are a corporate tool. Why would we care about you as a person. Who can’t hand a kid, born to digitizing mind, an iPad as an “instructional frame”? Further I’m more than confident this kind of “training” is so the teachers are not simply acting the fool in the classroom compared to their students who are by “nature” technologists. In other words we are awash in tech–it is from cradle to grave our only “mode of being” in America. If we were teaching kids how to THINK about technology THAT would be useful. How to be critical of it, how to NOT TRUST it but see its reality–its tentacles into all aspects of life. It is a commercial tool only. I am worn out arguing that the machine in the classroom TEACHES the context of the machine…the machine does the thinking, the machine does the suggesting. And who brings content to the machine? Commercial interests–corporate advertising. We just paid some “Apple” technologists to put more emphasis on living in Apple’s world. Further, to the the newspaper…when you say things like this it does not mean you have done your job in getting “all angles”: Although some community members have expressed concerned over more technology in the classroom, for Voss, adding technology has not hindered her students’ creativity, but has enhanced it. One cannot be “creative” and imaginative without some kind of “palette” from which to draw upon. What is the content of an imagination raised and educated to the digital box learning? It’s digital box creativity (if there is such a thing). And this too is reductive and constricting. Still, how do we not connect the dots from the detachment of digital instruction to the detachment of digital murder? From iPads to drone strikes. The community that supports the “bloodlessness” of technology. Still too, we are dependent upon energy for every aspect of living and this is another one of those things we don’t even think about. What are the ramifications of becoming a human iPad? What are the environmental ramifications of further toxic electronics “outmoded” after 18 months and thrown in the Indian Ocean? I have seen nothing that says teaching this way does anything EXCEPT support technology. IN other words–creativity is not enhanced, learning is not enhanced. Commerce is bolstered; Novelty is promoted; the faux notion of “innovation” is enforced. Innovation is the fallacy of the management paradigm–shifting and changing but always dominating our avenues of knowledge. We are further moving away from being, from feeling, to simply being “knowers”–no depth, no caring, no future but as a digital consumer. What kind of critical mind is fostered? It isn’t…accepting, receptive and nearly comatose. America the Digitized. Man ate of the tree of knowledge, and became ashamed of himself. Do you imagine Adam had never lived with Eve before that apple episode? Yes, he had. As a wild animal with his mate. It didn’t become ‘sin’ till the knowledge-poison entered. That apple of Sodom. We are divided in ourselves, against ourselves. And that is the meaning of the cross symbol. In the first place, Adam knew Eve as a wild animal knows its mate, momentaneously, but vitally, in blood-knowledge. Blood-knowledge, not mind-knowledge. Blood-knowledge, that seems utterly to forget, but doesn’t. Blood-knowledge, instinct, intuition, all the vast vital flux of knowing that goes on in the dark, antecedent to the mind. Then came that beastly apple, and the other sort of know- ledge started. Thus starts KNOWING. Which shortly runs to UNDERSTANDING, when the devil gets his own. No wonder the Lord kicked them out of the Garden. Dirty hypocrites. The sin was the self-watching, self-consciousness. The sin, and the doom. Dirty understanding. Nowadays men do hate the idea of dualism. It’s no good, dual we are. The cross. If we accept the symbol, then, virtually, we accept the fact. We are divided against ourselves. For instance, the blood hates being KNOWN. Hence the profound instinct of privacy. And on the other hand, the mind and the spiritual con- sciousness of man simply hates the dark potency of blood-acts: hates the genuine dark sensual orgasms, which do, for the time being, actually obliterate the mind and the spiritual consciousness, plunge them in a suffocating flood of darkness. You can’t get away from this. Blood-consciousness overwhelms, obliterates, and annuls mind-consciousness. Mind-consciousness extinguishes blood-consciousness, and consumes the blood. We are all of us conscious in both ways. And the two ways are antagonistic in us. They will always remain so. Who Runs the Indianapolis Public Schools? What Manner of Creature Be This? I think there are deeper issues here that have to do with the dominance of the visual sense.